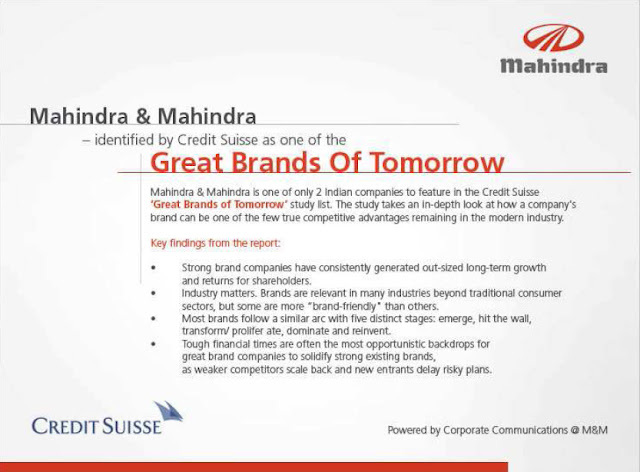 Auto major Mahindra & Mahindra is one of the only two Indian brands to figure in the list of 27 top 'Great Brands of Tomorrow' compiled by Credit Suisse. M&M shares this honor with leading global brands like Apple, Mercedes, Alibaba.com, Facebook.com and Swatch.The list was developed keeping in mind the stable growth of the equity of the leading brands in the period of next coming years in all three dimensions of scale, profits and returns. The jury quoted "Strong brand companies have consistently generated out- sized long-term growth and returns for shareholders" after reviewing the competition the ongoing brands provide to the world market. "We believe a strong brand is one of the most powerful and sustainable advantages a company can have, but one that is often ignored by the financial markets," Credit Suisse, Director, Omar Saad said. Saad also added a point stating,” We believe brand stocks will continue to outperform the market and our proprietary framework analyses brand lifecycles to determine how and when to invest in brands for optimal returns". During the survey, it was discovered that those companies listed on the S&P 500 spending a minimum of 2 per cent of sales on marketing, outperformed the index by more than 400 basis points annually since 1997. According to the report, Brand influence is most effective in industries where there is close proximity to the end-user. The brand reputation plays an important role in influencing consumers' purchasing decisions. The downward trend of the financial market has provided leading brands an upper hand to soar skywards and emerge as authoritative brands, while weaker competitors scale down and new entrants delay risky plans. Credit Suisse said, "Investing in companies that are transforming from niche player into a powerful brand that can be proliferated across new markets and categories offers investors extremely attractive returns. ".